Home Buzz Latin Ladies Night is BACK! WTM (what’s the move)? Ladies Latin night – and it’s Back by popular demand! 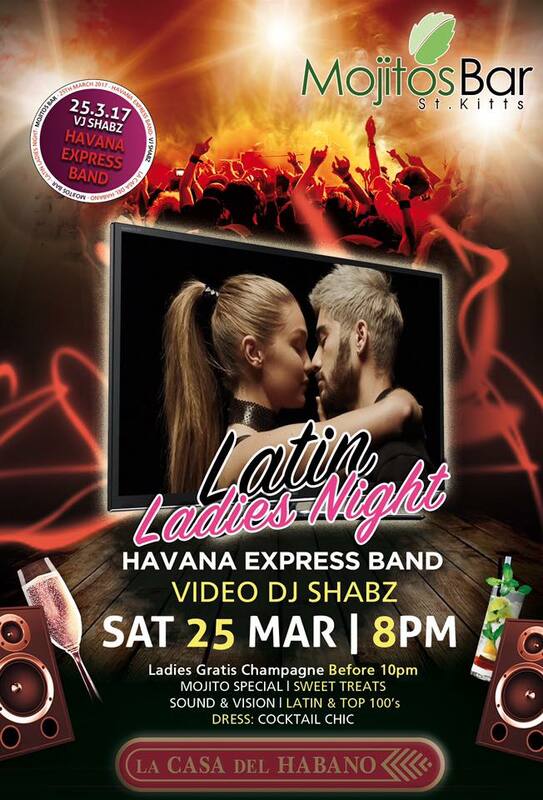 La Casa Del Habano St. Kitts, formerly known as Mojitos Cuban Lounge, will be having their second Latin Ladies Night of the year this Saturday, March 25th at 8pm. What makes this night so special? It’s a combination of their guests’ favorite night – Salsa Night + Ladies Night! Just like their usual Ladies Night, dress codes will be given, tasty treats will be shared, and all ladies will receive free bubbly until 10pm. Buttttt, guests will also enjoy the perks of Salsa night again this Saturday with the live Havana Express Band playing all their favorite Latin songs and mojito specials from Mojitos Bar all night long. That’s not all. Latin Ladies Night will feature the island’s baddest Video DJ – Shabz, who will present the Top 100 hits and their videos on the screen. If it’s back by popular demand, then this has to be something you don’t want to miss.